This post introduces you a free video converter for 2019 that is expert in converting AVI from/to various other formats like HEVC, MP4, MOV, MKV, etc with top performance - super fast speed and high output quality. AVI has once been the flagship of video formats in the past years. Though the usage of AVI videos is not as usual as before, AVI still fills a large quota of the videos especially for Windows users. But as the emerge of new devices MacBook, iMac, iPhone, iPad for example and the popularity of other formats like MP4, FLV etc., it is a great demand of 2019's free AVI converters to transcode AVI files to MP4, MOV, FLV, iPhone XS/XR/X/8/7/7 Plus, iPhone 6s/6s plus, iPad mini 4 etc to play avi on MacBook and other Apple devices. Here will assist you to find the best free AVI video converter. 1. Wondershare Video Converter Free for Mac is capable to free convert scores of SD video formats to AVI video files with ease. More incredibly, this fantastic tool also authorizes you to download and convert YouTube videos to AVI for playback on your smart phone or tablet so that you can appreciate wonderful YouTube videos offline without any confine. Yet, this free video converter for Mac reveals its drawback on limited preset profiles that it only converts AVI videos to iOS devices. 2. Any Video Converter Free for Mac, a well-received free AVI video transcoder to convert a vast variety of SD videos including MP4, FLV, 3GP, WebM, etc to AVI files, but also convert AVI to MP3, iPad, iPhone, Android, PSP, BlackBerry. More impressive function lies in its powerful knack to burn AVI videos to DVD disc with ultrafast speed. However, attention needs to be paid on its platform that it's barely compatible with Mac OS X 10.5-10.6, 64-bit processor, the latest 10.14 Mojave is beyond its compatibility scope. How about others? Handbrake is limited in output formats, FFmpeg avi to mp4 or VLC converting avi? Too complicated! The above converters for AVI for 2019 can aid you to convert SD videos to AVI but powerless to convert camcorder HD videos to your Android device on Mac. Fortunately, MacX Video Converter Free Edition is the very one to address your demand on your Mac OS X Tiger or higher (macOS Mojave included), disregard of 32/64-bit processor. * It will freely convert AVI videos from/to HD formats like camcorder videos AVCHD, M2TS, MTS, MKV and SD video formats including MPEG, MP4, MOV, 3GP, WebM, FLV, as well as free convert AVI to MP4, AVI to MOV, AVI to WMV, etc. * It also provides a hassle-free way to decode AVI videos for playback on iPhone XS/XR/X//8/7/6s/6s/6/Plus, iPad Pro/mini 4, Samsung Galaxy S9, HTC, Surface Pro and PSP or upload videos to YouTube, FaceBook. * It has a thunder fast speed and optimum high quality. Free download this best free video converter and launch it. Click "Add File" to load the video files you want to convert. Choose the output format from output profile list. 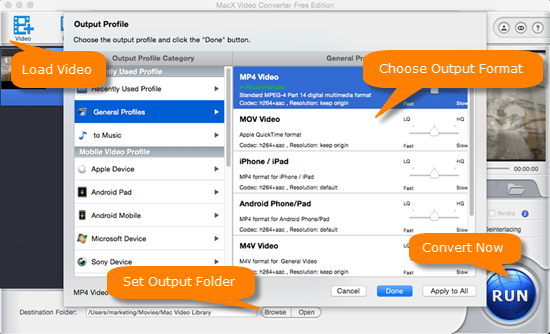 You can freely convert MTS to avi, avi to mp4, avi to mov, iPhone, iPad, or convert videos into avi files on Mac. Click the "RUN" button to start free converting videos from/to AVI on Mac, you could view the conversion progress and are able to cancel the converting process at anytime. Tips: This best free AVI converter can cover almost all your requirements on converting avi from/to mp4, mov or other formats. If you want to experience the fastest converting speed, you can approach to its advanced version MacX Video Converter Pro, the No.1 fast converter on the market. Besides, you can also record a game walkthrough or a tutorial for sharing on YouTube, blog and record video with Mac's built-in camera or external webcam and convert recorded video to MP4, MOV, FLV, etc on Mac so as to play it on your iPad, iPhone, Android, It can fulfill all you needs in a flash. How to Convert AVI to MPEG for Free? Top free AVI video converter to convert AVI from/to MP4, MOV, MKV, HEVC, etc. with 5X faster & top quality!